Below we will discuss a multitude of biblical references to show how far this one man matches what Scripture refers to as “the man of sin,” but before we do, 2016 will yield much to monitor Turkey’s rise to a Caliphate system which its initiation was sparked when on this Friday, Hayrettin Karaman, Erdogan’s main Fatwa giver issued some very strange declarations. This one statement yields a multitude of prophetic consequences. Bay’at, as Islam calls it, which is “giving allegiance,” is the hallmark of the Antichrist as John declared: “but the fatal wound was healed! The whole world marveled at this miracle and gave allegiance to the beast” (Revelation 13:3). And here this man who is given allegiance to is called “The Prince”, exactly as predicted in Daniel 9:26. This is how Erdogan was able to legitimize the corrupt and illegal practices of the Islamist politicians and businessmen. This includes getting bank credit with interest, a system not sanctioned by Islam but is sanctioned through Muruna, donating huge amounts of money to the charities of politicians in return for favorable public tenders and contracts, and even getting people killed for the benefit of the state. As Ali Bulaç wrote some time ago, Erdoğan started getting these fatwas after becoming mayor of Istanbul in 1994. According to the general theory of political Islam, the relationship between those who lead and those who are led is based upon a “contract of allegiance.” Those who are led declare, via their representatives, that they will obey their leader, thus surrendering all of their political rights — unconditionally — to said leader. And so the contract draws up the parameters for both sides: The leader will lead justly, while those who are led will be obedient. In the meantime, within the traditions of political Islam, those who use their power in this way are called “caliphs.” And a caliphate is, for leaders who rely upon religious references in the Islamic world, the name of the system that they will inevitably turn towards. Karaman very recently wrote another column on the caliphate. He argues that it is the best regime. His formulation is not a democratic one. Similar to Iran’s ayatollahs and mullahs, he wants to create a “mullahcracy” where the serious decisions will be given by Erdoğan’s mouthpiece fatwa-givers, not by the people. His Yeni Safak piece is one the greatest enigmas of the Erdoğan era. Nowadays, the AKP’s propaganda machine propagates that Hizmet volunteers are traitors and infidels. According to a poll that the İstanbul Institute conducted, 40 percent of people believe the Hizmet is made up of infidels. Many more see the movement as a puppet of the West. Pro-Justice and Development Party (AKP) figure Hayrettin Karaman issued a terrible fatwa about two years ago that, for the sake of protecting the state civilians and religious groups, should be terminated. Prime Minister Ahmet Davutoğlu stated that for the state, even the offspring of Hizmet volunteers should be sacrificed. Many pro-AKP figures in social media keep writing that the lives, properties and wives of the Hizmet volunteers are “halal” (permissible to be confiscated) by the Caliph, i.e. Erdoğan. We are of course not at that stage, thanks to external and domestic factors. Yet, the AKP regime started imprisoning Hizmet volunteers just because they donated money to Hizmet associations. The AKP has also been confiscating properties of Hizmet businessmen. So far, similar to the Holocaust, very few people in Turkey and abroad have vehemently objected to this and many more have been silently watching, thanks to the anti-Hizmet propaganda that they have been listening to for decades. Hizmet is the Gülen movement and is a transnational religious and social movement led by Turkish Islamic scholar and preacher Fethullah Gülen. The movement has no official name but it is usually referred to as Hizmet (“the Service”) by its followers and as Cemaat (“the Community/Assembly”) by the broader public in Turkey. When viewed in light of the natural balances between civil and political Islam, the current tension we see between the Gülen movement and Erdoğan makes much more sense. The war unleased by Erdoğan against the Gülen movement is at the same time a war unleashed by political Islam against civil Islam. By declaring the civil arena the enemy, Erdoğan has radicalized the political arena. And today, in order to wield power and authority that is not constitutionally his, Erdoğan has a need for strong Islamic models such as the caliphate. I do not want to disrespect the noble memory of the Holocaust victims by likening their terrible fate to what is happening nowadays to the Hizmet Movement volunteers in Turkey. The Holocaust is not, and cannot be, comparable with any human suffering on earth. It is unique. Nevertheless, I argue that human nature has always essentially been the same and evil humans have always acted in similar ways. The motivations, argumentations, tactics and actions of today’s cruel humans are not very much different from the Nazis. It is true that what Hizmet volunteers have suffered so far is not even one millionth of what the innocent Jews suffered. But if the evil people in Turkey can find it necessary to eradicate the movement and if they can find the opportunity, they will not hesitate to follow the footsteps of the Nazis. Let me explain. First of all, unfortunately, Turkish socio-political culture is not immune from the sickness of trying to destroy the other. Especially when it comes to political dissent, the states on these lands have acted swiftly and brutally. Ottoman history is full of such terrible examples of crushing dissent by brute force, the Alevis being the main sufferers. What the secular-nationalist Young Turks did to the Armenians in 1915 speaks for itself. While hundreds of thousands of Armenian men, women and children lost their lives, their Kurdish and Turkish neighbors were either “buying” their goods and properties for very cheap prices or they were looting them. The many heroic Kurds and Turks (officials and civilians) who helped the Armenians were not treated well by the rulers. The Greeks also had similar problems. During the night of September 6-7, 1955, their goods and properties were looted as a result of a government-motivated pogrom. While some Alevi intellectuals were being burned, most probably by the deep state, at a hotel in Madimak in the early 1990s, thousands of Sunni civilians were watching the fire without feeling anything, to say the least. For the first time in 13 years, the Turkish AKP, led by President Erdogan and Prime Minister Davutoglu, has lost its majority hold on the parliament which held 312 of the 550 seats in parliament and now only holds 258 seats while the other three (CHP, MHP and HDP) now has 292 seats. So does this set back mean the end for Erdogan and the AKP Party and are we to now eliminate the man of Turkey as the wrong candidate from being the Antichrist? The Antichrist, when he emerges, he forms a league and advances with a small number of supporters. 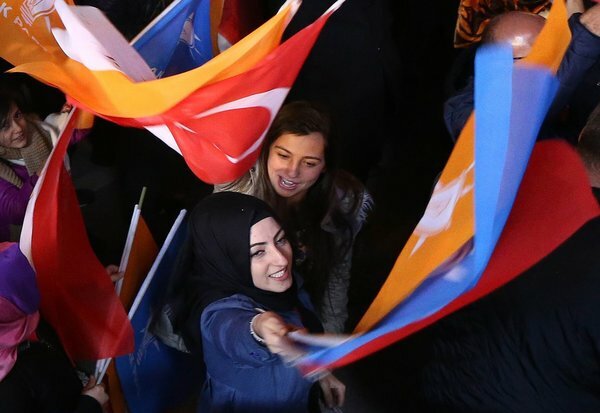 Historically, the AKP began from a small number of people, the Refah Welfare Party which participated in the 1991 elections in a triple alliance with the Nationalist Movement Party (MHP) and the Reformist Democracy Party (IDP) to gain 16.9% of the vote. It was truly the incumbent PresidentRecep Tayyip Erdoğan, a former member of the party, but later founded Justice and Development Party (AKP) who catapulted the AKP to what it is today which still holds over 40 percent of the seats defeating all the other three. This is truly a victory for the Erdogan who started with “a few number of people”. And now that Erdogan will uproot the three horns in Turkey’s government, 2016 will have major consequences to world events, especially prophetically, and by 2018, we estimate the prophetic scene will be very clear and by 2023, we foresee that all hell will break loose. So what are the chances of soon seeing the rise of the Antichrist and what of these criteria does Erdogan match? And what are the probabilities that one man hits the nail on several issues? The results will shock many to find any other man that fits the labels. In everything Erdogan does, Erdogan parallels Antiochus Epiphanies. He caused deceit to prosper (Daniel 8:25). He is “king of fierce countenance” (Daniel 8:23). He is starting animosity with Egypt (Daniel 11:42). Erdogan wants to become “chief” and “prince” of Meshech and Tubal (Ezekiel 38:2, Mushki and Tabalani in Asia Minor/Turkey). He is changing set laws (Daniel 7:25) to make solid his princely title. “If Tayyip Erdoğan shifts to a presidential system, he will probably assign advisors from the regions under the caliphate and open representative agencies of all Islam Union nations in that 1,005-room [the presidential palace] in Beştepe,” said Dilipak speaking at a conference organized by AKP Toronto Election Coordination Center in Canada. Dilipak also added that Erdoğan would assign advisers for all Muslim nations in the world. Erdoğan has been known for his longtime aspiration for a presidential (in reality Caliphate) system in the country. The crowds waves to him the “fiery red, hyacinth blue, and sulfur yellow” (Revelation 9:17). It would be a matter of time to get these colors into their new emblem. After the victory, Erdogan’s supporters waved the fiery red, hyacinth blue and sulphur yellow banners that resemble the Islamist party. Erdogan matches Habakkuk who speaks of Antichrist as “the Proud Man” who “enlarged his desires as hell, and is as death, and cannot be satisfied, but gathereth unto him all nations, and heapeth unto him all peoples” (2:5). Erdogan is definately a “proud man” who desires to “gather unto him all nations” in his neo-Ottoman Caliphate dream to unite the Muslim world. He denies Father and Son (1 John 2:22) and “does not honor the God of his fathers” as Turkey at one point in time was Christian. These are major figures and Erdogan is acting as if he is Christ who did not denounce worshiping Him and Erdogan did not denounce worship either. And if one thinks that it’s only the followers who elevate Erdogan to prophet, healer, master of the universe and nature, or deity, think again. One news media from Istanbul, wrote this regarding Edrogan himself, firing anyone who denounces him being God. He traveled to the Central Anatolian province in order to attend the Şeb-i Aruz (Night of Union) ceremony to commemorate the 741st anniversary of the death of Jalaladdin Rumi (Mevlana) in the evening. “If we have a homeland and a flag today, and if we live in an independent country, all fraternally, this is thanks to believers like Mevlana, Ahmed Yesevi [Rumi], as well as our generals such as Saladin (of Ayyub dynasty) and Alparslan (of Seljuk dynasty),” Erdogan said. Rumi is crucial for Erdogan’s dream of deity. Then we have countless statements made by Erdogan where he hones in on Jerusalem. And if Christ said that “Jerusalem is the apple of My Eye,” that is Christ’s eye, Erdogan said: “Jerusalem is the apple of every Muslim’s eye”. Erdogan, the ruler of Turkey, this flag of the red dragon with the two horns of the crescent, issued “a flood” (Revelation 12) into Europe where the heart of Christendom was in scenes that were unprecedented in history where Germany and the E.U came to Erdogan begging to stop this flood. It will be a matter of time when the woman who gave birth to the man child (Christ) stomps the crescent under her feet (Revelation 11-12). Erdogan as he causes havoc in Syria is getting “bad news from the north” (Russia, Daniel 11:44) and desires to also rule Iraq (ancient Babylon) setting up encampments there. He is getting ready to qualify as “King of Babylon” (Isaiah 14:4, a title given to Antichrist). Qaradawi, the spiritual head of the Sunni Muslim world, declared Erdogan speaking of a sign of the end of the world when he declared that the “angelic host will soon descend on earth” after this establishment of the coming Caliphate in Turkey. From a Christian perspective this is the casting of the fallen angels which Daniel the prophet spoke about the minions of the Luminous One, Lucifer are finally cast out and the Antichrist of Isaiah 14 to soon be revealed. Qaradawi speaks of confederacy sparked by Turkey of different Muslim states mentioned in several major Scripture passages (Dan 2:31-35, 40-45; 7:7-8, 19-24; Rev 13:1-2; 17:3, 7, 12-16, Ezekiel 30 “the league” and the entire context of Ezekiel 28-31). Erdogan does “not honor the desire of women” (Daniel 11:37), prohibiting them entry in the government and promoting the wearing of the hijab. The Muslim scholarly powers has already asked the Muslim world to pledge allegiance to Erdoğan. So in order to convey my two-decade persistent message, I brought forth other watchmen from the source itself in Turkey. Today’s Zaman, a favorite of mine and a persecuted voice gives a similar perspective of what I have been trying to say for a while now, but hearing it, from the horses mouth if you will, can bring in credibility to my trumpet sound of this coming flood of nations, and with all these probabilities, from here, from my ark, it will start slowly, then it will thunder as my voice thunders to the hills, to the valleys and to the nations. Is anyone listening?